Why is Profusion360 the Most Powerful and Effective Real Estate Marketing Platform? Let us provide some clarity for you. You’ve been searching for the right company that can provide you with the best product for your real estate business. However, you’ve come across so many companies that seem to offer the exact same thing. We understand it can get very confusing. There is absolutely no other product like Profusion360’s real estate marketing platform. Please watch the video as we explain what makes Profusion360 different and the only true, all-in-one, real estate marketing platform for real estate agents, teams, and offices. 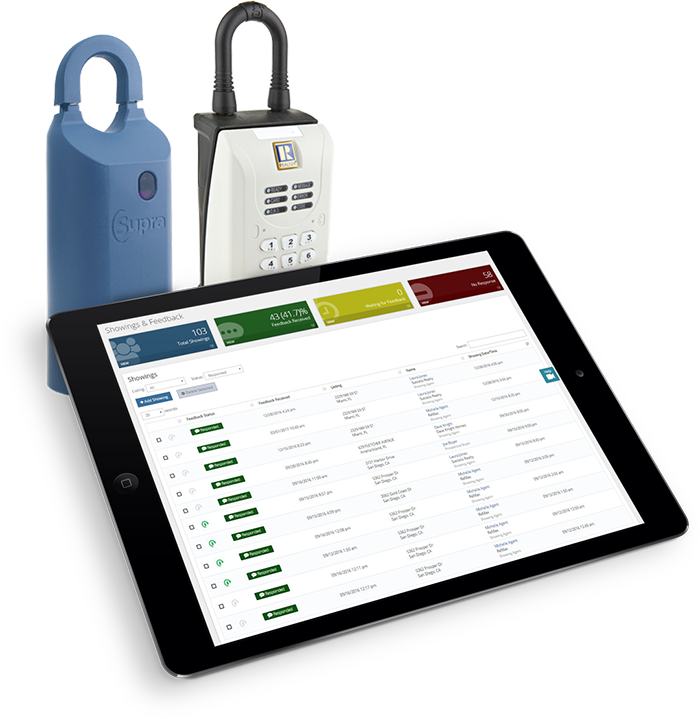 Profusion360 is the ultimate real estate marketing platform for real estate agents, offices, and brokers. Our platform provides multiple lead generating channels from your real estate agent website, IDX, landing pages, virtual tours, property websites, social media, showing feedback, and more. 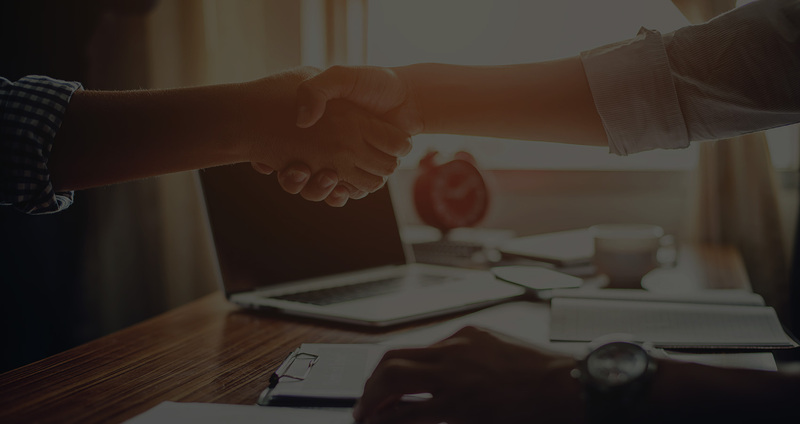 Our real estate CRM system will make sure every lead is captured and nurtured to the fullest so you can close more deals. Nobody can offer more on one single integrated real estate platform than us. Profusion360 is a real and true, all-in-one real estate marketing platform! 75% of people will base your company’s credibility on your website’s design. How is YOUR real estate website looking? 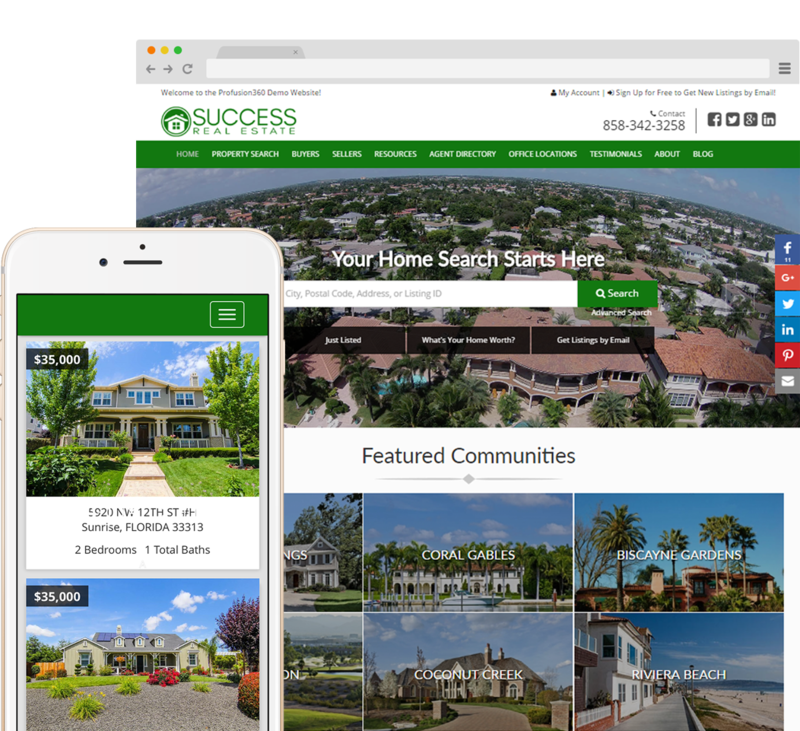 Not only to we provide the best looking real estate websites for agents, teams, and offices, but they are packed with features and tools that will be valuable to your clients and prospects. With MLS property search, search tools, and listings by email, your real estate website will be the choice of prospective buyers. Users will be able to search for all available properties on the market using home search tools. Users will be able to sign up right on your real estate website and access search tools such as saving favorite properties and searches. Our system will automatically send your prospects the latest listings by email so you’ll always be connected to them. 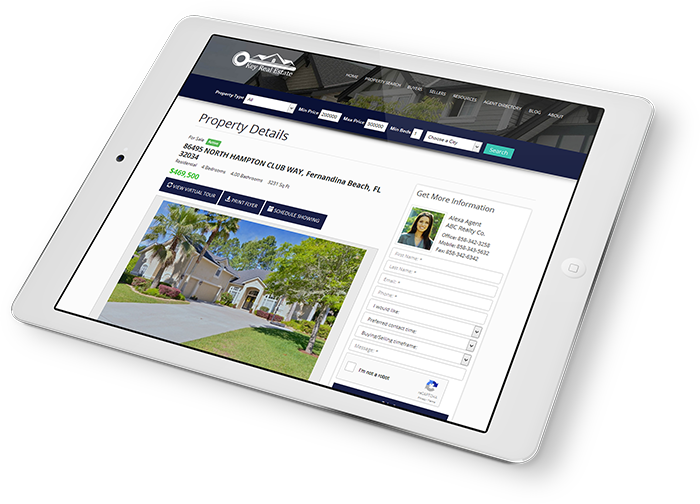 Built on our own website platform designed specifically for real estate agents, teams, and brokers, our agent and office websites are packed with all the features you need to attract new prospects and make your website the choice for your clients to use to search for properties. Do you want to build a sales pipeline that will create a constant stream of revenue and grow your real estate business? 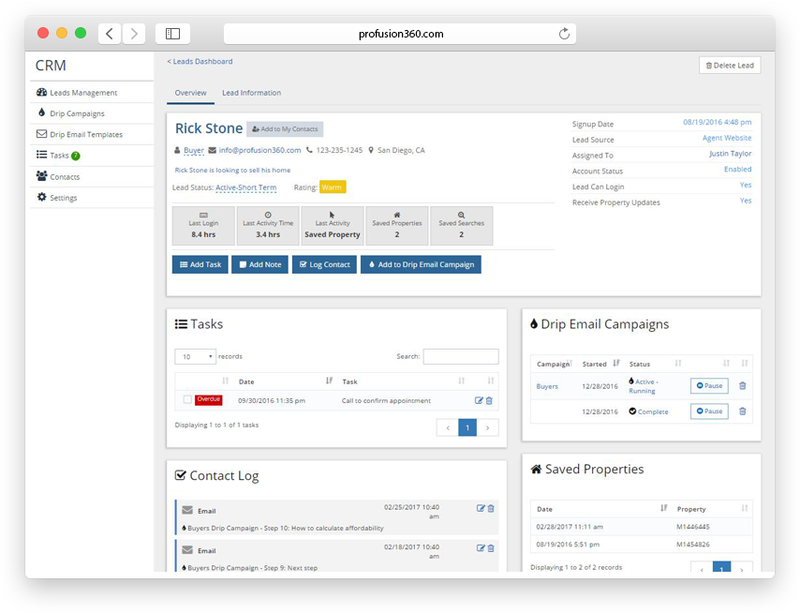 Profusion360 real estate CRM provides the tools to do so. With all the leads you’ll be generating through the different channels we provide, you’ll need a central platform to manage those leads and nurture them. 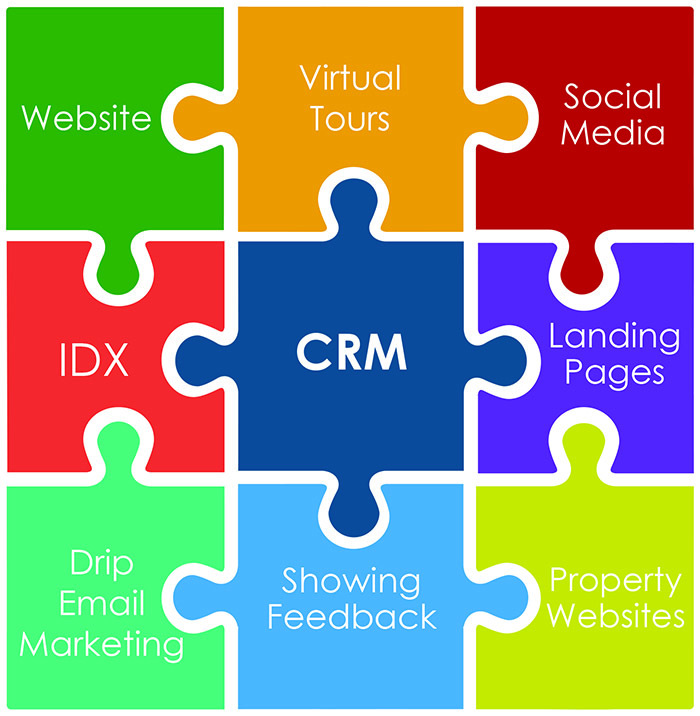 All your leads from your real estate website, IDX, virtual tours, property websites, landing pages, social media, and more are funneled into our real estate CRM system. Getting leads from Zillow or Trulia? No problem. 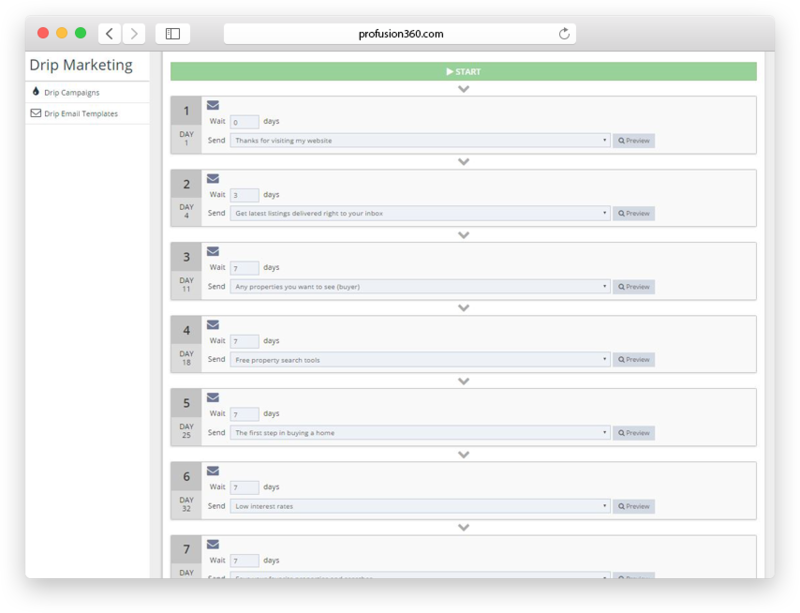 Profusion360 will capture them right into our CRM system so you may utilize our lead management and nurturing tools. Creating a healthy sales pipeline for your real estate business doesn’t happen overnight. With drip email marketing, you’ll be able to create campaigns that will automatically stay in touch with your prospects for months and more. This is the key to building a strong sales pipeline that will allow you to move leads from being a new opportunity to money in your pocket. Others providers will give you with a landing page design builder, but that’s actually only a small part of the complete solution you need to actually generate leads. For an effective lead generation solution, you’ll also need lead magnets such as homes lists and property websites, along with an integrated CRM system to capture and nurture leads. Our landing page solution provides it ALL to you. Along with our “Done For You” landing page designs that will save you hours, we also provide integrated lead magnets including homes lists and listing pages along with a CRM system to capture, manage, and nurture all of your leads with drip email. It’s the only COMPLETE landing page solution that’s ready to start generating leads for you immediately. Profusion360 provides high-end, professional, lead generating websites for real estate agents, teams offices, and brokers. But what really sets us apart from everybody else is our powerful Listing Marketing Engine, Showing Feedback System, and CRM system. With our Listing Marketing Engine, you’ll get Virtual Tours, Property Websites, Listing Flyers, Ad Generator, Social Media sharing, and Listing Syndication for all of your listings. 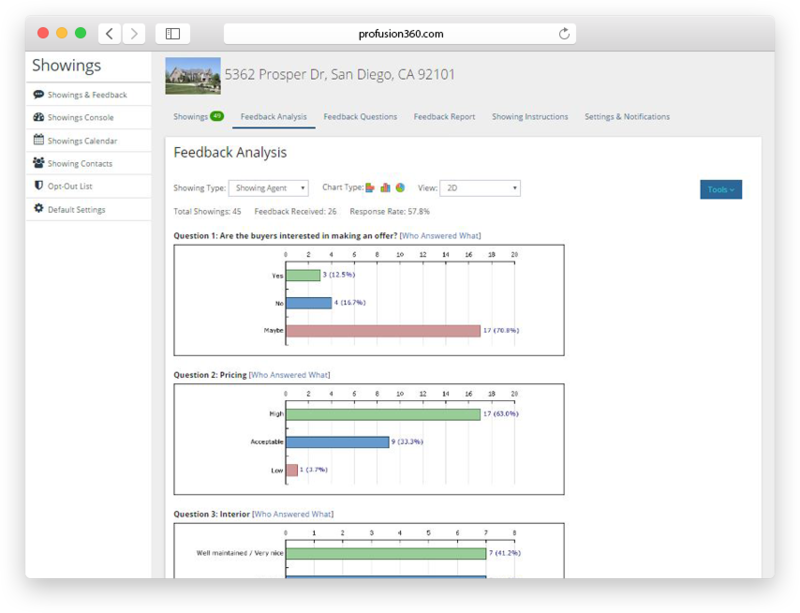 Our Showing Feedback System is an automated system that obtains showing feedback from your listings. To top it off, our real estate marketing platform is supported by our CRM system to capture, manage, and nurture your leads. 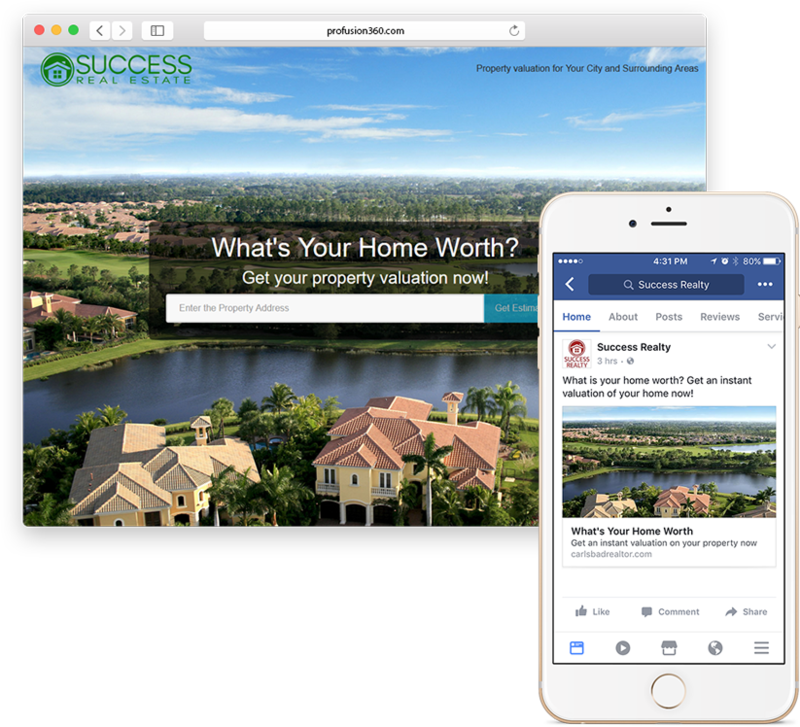 Profusion360 is the Ultimate Real Estate Marketing Platform! With our automated listing marketing engine, you’ll not only have a system to sell your listings faster, but you’ll be able to capture more buyer leads across different channels. The Profusion360 real estate marketing engine automatically generates marketing for all of your listings including virtual tours, property websites, social media posts, flyers, Craigslist ads, and listing syndication. Not only will this save you an abundance of time, but you will no longer need to pay for separate vendors to provide this real estate marketing to you. Want more seller prospects? Use our customizable Comparative Market Analysis landing page on your real estate agent website, social media posts, blogs, agent profile pages, or anywhere you want to capture an abundance of seller leads. Our home valuation landing page will give instant property valuations while capturing the prospect’s contact information. Since our Comparative Market Analysis landing page is seamlessly integrated with our CRM system, all of your leads are captured and inserted into our lead management system for tracking and nurturing. With our tracking link generator, you’ll be able to track where your leads are coming from and evaluate the performance of your Comparative Market Analysis landing pages. We know you don’t have time playing phone tag and trying to obtain feedback from your showings. With Profusion360’s automated showing feedback system, we’ll get the showing feedback you need so you may use that time to focus on getting more clients. Our tools, seller feedback report, and seller portal will allow you to keep your seller updated on the latest showing activity. On top of that, you’ll have one central place to manage all your showings so you may contact them if you need to. Profusion360 offers the best real estate marketing platform for you business. Request a demo today and let us show you how we can help you grow your real estate business.